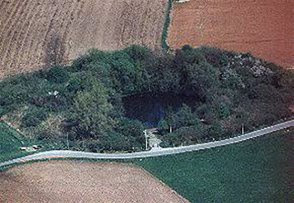 Aerial photograph of Spanbroekmolen Crater. "Early misty morning. Doves coo-coo, cows moo. A path leads through the thick undergrowth to an idyllic lagoon. Another path follows the rim, it seems. I follow the path along the rim. The dew on the bushes makes the clothes, the shoes and the camera wet. The woolen sweater get stuck in the thorns. Halfway around, the path opens out to the water-filled crater. I return to the road. Towards me at the road comes a dirty little old man in dirty blue overall. He stops and throws his old bicycle in the ditch, grinning. With gestures and words in German, English, French, Flemish and probably other languages too, I am persuaded into following him out at the muddy field. We walk half-way around the crater, where he suddenly disappears into the bushes. He returns and shows me a tilted concrete bunker hidden by the bushes at the edge of the crater rim. As a young boy he climbs down and in through an opening. Inside, in the darkness, he removes a part of the steel reinforcement which he hands over to me through the opening: ”Souvenir, souvenir”, he says. He climbs up again, while keeps babbling. He tells me that he was sent to Germany during the Second World War for forced labour, and that he was born at the farm which he points at, where there is another bunker, which he point out in a field. He also, chuckling, points out in the landscape and on his body (the crutch) where - he says - Hitler was wounded 1917. Frenetically, wearing no socks in his old heavy boots without shoelaces, he runs around in the muddy field picking up shrapnel bullets and grenade splinters, which he insists I should have as keepsakes. 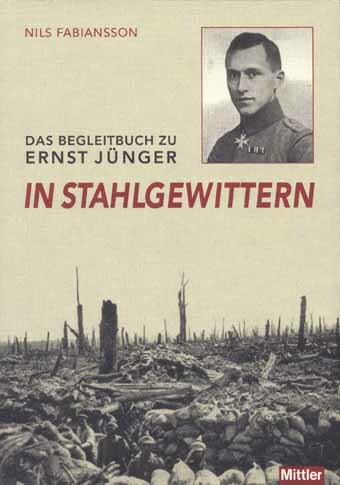 I find it quite amazing: The German lines of the Western front crossed the farm he was born at, and he was sent Germany during the Second World War. When we say goodbye, this little friendly giggling old man realize that I am not German."